Taste test: These are very large tortilla chips, each shaped like a quarter circle. 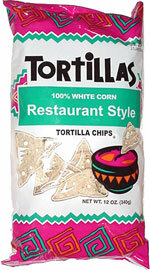 They taste pretty good, a lot like most tortilla chips, with coarsely ground corn and a good amount of salt. If I had some salsa here, they'd probably be really good for dipping, because their sheer size could allow these to hold quite a lot of dip. From the package: “Try out other Tortilla snacks” ... 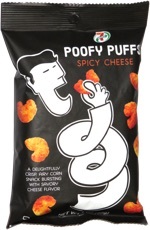 The bag bears a close resemblance to that of Tostitos Restaurant Style chips.